This 'Bryans History' was written and compiled from many different sources of published information, and from recollections of fellow collectors. As far as I know, this is the most comprehensive Bryans history ever published. If you have any additional information, or corrections, please email me. 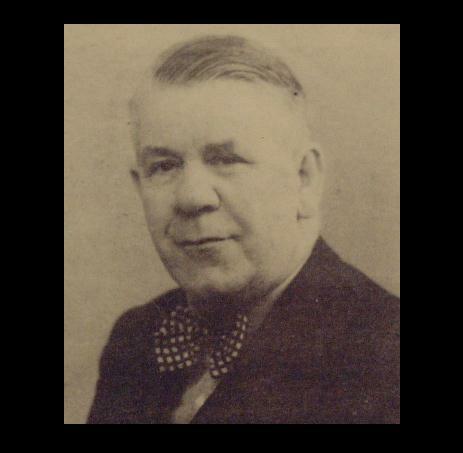 William Edward Bryan was born in Leicestershire in 1894. After finishing his education at Derby School, he took up an engineering career, starting as an apprentice with the firm of Rolls Royce in Derby. His career was cut short by the outbreak of war in 1914, when he volunteered for duty in the Royal Navy; but he was soon transferred to the Royal Navy Air Services as an airship mechanic, because of his engineering background. In 1918 he was transferred to the new Royal Air Force (RAF) as a sub-lieutenant. In that same year he set up a record for the longest airship flight, of just under 51 hours. He was also nearly killed when his plane crashed into the end of St.Leonard's pier! Whilst in the RAF he was awarded the Distinguished Flying Cross for gallantry while on submarine patrol. So he became William Bryan D.F.C. Despite the problems, this venture reinforced his interest in slot machines, and he invented his first amusement machine in 1927. This was the Odd Clod. The idea of the game was to project a coin into a cup to win. The machine had slots for a halfpenny and a penny, with the penny providing a better game. Judging by the lack of surviving examples, the Odd Clod was either a complete failure, or more likely an experimental design. After taking out two vending machine patents in 1928 with the Thrissell Engineering Co. of Bristol he turned his attention to his second amusement machine. The Clock was patented in 1930 and was initially marketed by Leslie Chappelow of the Northern Automatic Co. of Leeds. The Clock really took off and became one of the most successful machines he ever made. It competed successfully with the flood of one-armed bandits being imported from America, and sales were so good that he had to hire extra staff to cope with the demand. By this time he had left the garage trade and had opened up his own factory 'The Bryans Automatic Works' in London Road, Kegworth. The premises were a former wheelwright's workshop. By the time of the 1933 machine exhibition at Dorland Hall, Bryan had designed four new games: the Waterfall; the Windmill; the Trickler; and Pot The Copper. The Trickler was the first of his wonderful ball catching games and the 1934 Olympia Exhibition saw the launch of two more: the Rippler and the amazing Payramid, with the Six-or-More just around the corner. Bryan now had nine entirely novel and innovative amusement machines to offer the showmen, and they were causing a sensation. At that time, just about the only amusement machines available in any quantity were the one-armed bandits from America, and the Allwin-type games from Europe; and very little else. It's not hard to imagine the sensation caused by this new British firm, with their clever game designs and brilliant mechanisms. The Kegworth factory were now working a 12-hour 6-day week to keep up with the demand, and had to move to larger premises in Sidely Road in 1935. The 1930s was Bryans most successful decade, with the whole industry beating a path to his door. The showmen couldn't get enough of his machines, and other amusement caterers were also coming to him for assistance. In 1935, Wally Meigher of the Walden Automatics Company approached Bryans to manufacture a giant crane. The result was the Walden Goliath Crane. By 1936 Bryan was marketing his own Cranes, the All Square and the Multi-Sided Crane. There was no stopping the inventive flow from William Bryan. Despite the full order books, the latter part of the 1930s saw yet another flood of new and original game designs: The Rockets; the Nudist Colony; the Bumper, the 2-player All Sport; gift vendors like the Bran Tub, Pendulum, and Prize Finder; and the fabulous Hidden Treasure. In less than ten years, Bryans had become the largest manufacturer of coin-operated amusement machines in the country, with around 20 different machines to offer, and the factory struggling to keep up with the demand. Then in 1939, thanks to a man called 'Hitler', it all came to a sudden and dramatic stop. On September 4th 1939 the factory had to be closed down. In that same month, William Bryan now rejoined the RAF as a commisioned officer in the engineering branch, whilst the factory at Kegworth was given over to the war effort. He left the RAF once again in 1945, this time as Squadron Leader Bryan D.F.C. After the war, the country was in turmoil, materials were in short supply, food was rationed, and non-essential manufacturing industries were having a very hard time trying to pick up where they left off six years earlier. 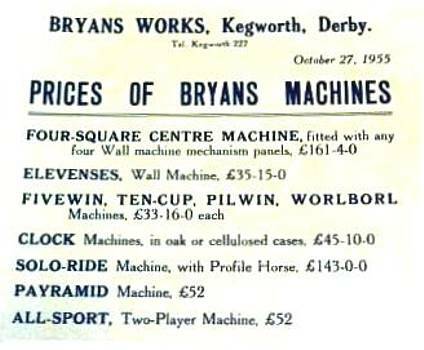 Nevertheless, Bryan kept dreaming up ideas for new machines, and by 1946/7 he was back in business again in London Road! Bryan's son Jim joined the factory in 1948. At the 1948 Amusement Trades Exhibition at the new Royal Agricultural Hall Bryans unveiled no less than four new machines: the 12-Win Clock; the two Magic Machines, and the Retreeva. However, the mood of the nation had changed since the heydays of the 30s, and sales were disappointing. The country was in a financially depressed state after the war, and people were not too interested in spending money on amusement machines - either buying them or playing on them. The 12-Win Clock was the most successful of the new machines as it was an improved version of an already-popular machine. The Retreeva also enjoyed some success, but the Magic Machines went down like a lead balloon despite the novelty of their conception. The idea for a third Magic Machine was dropped. This didn't see the light of day for another 36 years. A photograph of the Bryans stand at the 1954 Alexandra Palace Exhibition shows no sign of the Magic Machines or the Retreeva. During this and other periods, Bryans undertook servicing and repairs on existing machines, including machines by other manufacturers. Not only did this enable him to keep an eye on what the competition was doing, but it also allowed him to swap old machines for new Bryans machines as a way of getting around the government regulations on the use of materials immediately after the war. The stock of 'foreign' Allwin cases thus gained would soon come in handy! The late 1940s and early 1950s were difficult times for the Bryans factory. The economic climate was bad, though slowly improving, and raw materials were difficult to obtain and of varying quality. The Korean War of the early 50s also had an adverse effect on the availability of materials. The factory did turn to other projects during difficult periods, for instance tools and toys, but details are sketchy. Bryan did take out a number of patents for tools, examples being a floorboard splitter and a bag packer. The Breezy Wind Toys are from this period. In 1952, William Bryan began the design of a coin-operated Kiddie Ride which was eventually marketed at the end of 1953, and given pride of place at the 1954 Alexandra Palace Exhibition. Unfortunately, the coin-op ride market was already very competitive and, although Bryan's ride was far more sophisticated than the other rides on the market, it was undoubtedly more expensive to produce and therefore failed to sell. In 1953, possibly with some desperation, Bryan turned his attention to the common Allwin. Allwins of one type or another were very popular machines in the British amusement arcades, and Bryan had so far resisted the temptation to jump on the Allwin bandwagon, possibly because he prided himself in coming up with new and original games, and everybody seemed to be making Allwins. If he could produce an Allwin design, and add the usual Bryans extras to it, maybe he could come up with another winning formula and beat the competition at their own game (literally!). He set about designing his own 'universal' Allwin mechanism, incorporating his patented Variable Pressure Unit and unique anti-jamming payout mechanism which provided adjustable payouts. He initially marketed two machines: the Fivewin and the Pilwin Play. The early cases were made up from re-cycled Allwin cases from other manufacturers, and the backflashes were simple affairs consisting of cut-out strips and painted at home by Mrs Bryan! Initial sales were encouraging, and during 1954 Bryan developed and further refined his Allwin mechanism, adding a multiple payout capability and redesigning it so that only a single ball exit hole was necessary in the playfield. In 1955, he installed his new mechanism in the Elevenses, an Allwin design with eleven winning cups, multiple payouts, and full operator customisation. From that point, he never looked back. The Elevenses went on to become the biggest-selling Allwin of all time. Further Allwin designs followed towards the end of 1955, including the Tencup; the U-Win, the Gapwin; and a new Pilwin design. The runaway success of Bryans Allwins was due to the ease with which the payouts could be customised (enabling the machines to be sited at any location) and the fact that he always made sure that the games looked very easy to win, so that the public would put lots of money into them! A Payramid for £52 - anybody? Judging by the numbers surviving, the factory must have been back up to capacity again, turning out thousands of Allwins in the late 50s and early 60s. But Bryan hadn't finished reinventing the Allwin yet. In 1961 he designed and patented the most feature-packed Allwins ever produced. These were Allwins with 3 balls; jackpots; flickers; winding handles; and catchers, and all packed into a standard Allwin case! Unsurprisingly, these were hideously complicated and expensive machines to produce, and only enjoyed a limited success compared to his more conventional Allwins. The problem with many of Bryan's machines was that they were very complex and expensive to produce. He spent a lot of time devising simplified manufacturing techniques and making sure that the mechanisms were not over-engineered, but still very reliable. The production costs of his better machines were still high though, compared to the simple games coming from his competitors. The early 60s, saw Bryan making changes and adaptations to some of his earlier designs, in an attempt to reduce the prices of his machines and make them more competitive in the marketplace. The Payramid was still one of Bryan's best sellers and underwent major changes in 1960 to simplify its mechanism. The Tick Tock was a cut-down version of the Hidden Treasure; the Fruit Bowl was a simpler variation of the Clock; and the Crane also underwent modernisation around this time. However, it wasn't all redesign work during this period. In 1963 Bryan came up with the last of his wonderfully complex mechanical contraptions - the Bullion. A very successful mechanical Roulette game which sold well, despite its complexity. William Bryan's mechanical ingenuity had enabled his firm to stay on top for 35 years. But he was now in his seventies, and the technology was changing. Electro-mechanical machines had arrived and were starting to change the slot machine industry. The mechanisms that Bryan had cleverly created with a conglomeration of pivoted levers, springs, detents, linkages, pawls and ratchets could now be built relatively cheaply with relays and solenoids. William Bryan retired in 1966, leaving his son Jim at the helm. With the genius behind the machines gone and technology turning against them, I guess the future must have looked pretty bleak for the Works at that time. So much so, that William agreed to go into semi-retirement, and returned to the factory to continue his design work. The 'Coin Pusher' came along in the late 60s, and Bryan rose to the occasion by designing two coin pushing machines (of above-average complexity, naturally!). He produced his last new game design in 1970, the Double Top. This was a 2-player Allwin, a concept which the public just couldn't understand! The UK converted to decimal currency in 1971 and this undoubtedly kept the factory busy during the early 70s. Some of the pre-decimal coins like the shilling and florin continued to be used after 1971 (they were just called something different) but the large penny coin was withdrawn. This was fortunate for Bryans as almost all of their existing machines worked on the old penny! So, as well as converting their new machines, there would have been a large market for the supply of conversion parts for thousands of their existing machines. In 1973 William finally retired completely. He was 79, so I guess he had earned it! At this time Bryans still had around 16 machines in their catalogue, including the Payramid, Worlborl, All Sport, Bullion, Crane, all the Allwins, and the new Double Decker and Double Top. The world was moving on fast now and Bryans were rapidly being left behind. All of their machines were based on mechanical principles, and now all-electronic machines were starting to appear. Even the relatively new electro-mechanical machines, with their noisy relays and selectors, were starting to look old-fashioned! This was also a time when cheap new plastic materials and manufacturing techniques were taking over from the more traditional and skilled methods of construction. These new techniques allowed machines to be produced much more cheaply than those using the traditional materials of wood, metal and glass, which Bryans continued to use. Amusement arcades were changing drastically, and tens of thousands of the old mechanical games were being thrown out in favour of the new machines with their electronic sound effects and flashing lights. Not surprising really. Just about all of the old amusement machine manufacturers went out of business at this time, but somehow Bryans managed to survive. I suppose that must be a miracle in itself. William Bryan died in 1984, three weeks before his 90th birthday. The factory continued to operate on a smaller scale, making new machines and supplying spares to operators and collectors. During this period the Magic Spirals machine was produced for the first time. This machine had been designed alongside the other two Magic machines in 1948, but was never put into production, undoubtedly due to the market failure of the other two machines. In 1990 the factory moved to smaller workshop premises in Packington Hill, and the original belt-driven machinery and other important artifacts from the London Road factory were taken to Drayton Manor Park the following year. The Drayton Manor Family Theme Park in Tamworth is owned by the Bryans family, and it was decided to set up a museum to preserve the history of the Bryans Works and exhibit some of the vintage machines for the public to play on. This must have been quite a controversial idea at the time, as there would have been very little public interest in this sort of thing in the early 90s. Fortunately, the country's appetite for anything nostalgic has increased since then, and the attraction now creates quite a bit of interest, especially amongst the growing number of collectors. Jim Bryan continued to keep the workshop open during the 1990s. However, for some inexplicable reason, its existence was never advertised and there was no attempt made to capitalise on the growing collector market. The existence of the workshop seemed to be kept a secret. Indeed, even the Bryans Museum seemed to give the impression that the business had closed down when the London Road Works closed and the machinery was transferred to the museum. There was no information given about the factory transferring to new premises and continuing in business with modern equipment. Even keen collectors were astounded when they were informed that the Bryans firm was still operating in Kegworth over 20 years after the machines had passed into history. However, their jubilation was often short-lived, as letters frequently went unanswered for one reason or another. The workshop did service machines and supply spare parts but it appears that they were very selective of what they supplied and to whom. Some lucky collectors did manage to order and receive complete machines from the workshop, but these were very much in the minority. The collector market for Bryans machines grew considerably during the latter part of the 1990s, and values soared, but Jim Bryan didn't seem to want to have anything to do with it. He must have had his reasons, I understand he was not in the best of health, but surely somebody could have been employed to run the workshop. For whatever reason, the golden opportunity to turn the Bryans concern into a thriving business again was not taken. The Bryans story came to a tragic end on the weekend of 18th November 2000. The workshop was badly damaged by four separate fires as a result of an arson attack on the premises. Many wooden artifacts were destroyed, along with quantities of original papers and documents. As the lease on the building was due to run out early in 2001, it was decided to finally bring the Bryans operation to a close. By the following April, all surviving items had been taken to Drayton Manor and the premises had been cleared out. So, after 75 years, the remarkable Bryans story unfortunately had a sad ending. The tragedy is even greater that the Works should close when collector interest and demand for the machines and spares is soaring. That the factory should survive the barren times of the 80s and 90s, and then close when hundreds of collectors would have queued up to buy brand new Bryans machines (if they had known that they could) is particularly ironic. Jim Bryan sadly passed away three years later, on 13th December 2003, finally closing the door on Bryans Automatic Works. It may be the end of an era, but William Bryan's legacy lives on in the thousands of surviving machines lovingly restored and enjoyed by the ever-growing number of collectors and enthusiasts the world over.